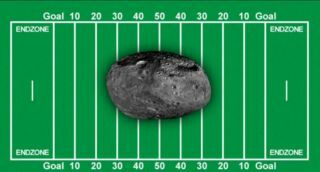 Asteroid 2012 DA14 is about the size of half a football field and will make a close approach to Earth on Feb. 15. An asteroid half the size of a football field will make a close approach to Earth, but poses no threat of smacking into the planet, NASA officials said today (Feb. 7). The asteroid will not only pass between Earth and the moon's orbit, but also fly lower than the ring of geosynchronous communications, weather and navigation satellites that fly high above the planet. Asteroid 2012 DA14 will be 5,000 miles (8,046 km) closer to Earth than those satellites during the flyby. Geosynchronous satellites typically orbit about 22,000 miles (35,800 km) above the Earth's equator. Asteroid 2012 DA14's close encounter is also a record-breaking celestial event, Yeomans said. An object this large only passes this close to the Earth about once every 40 years, and likely only hits the planet once every 1,200 years, he added. Amateur astronomers have already captured some photos of asteroid 2012 DA14, and NASA plans to make detailed radar observations of the space rock to learn about its composition, spin and surface features, the scientists said. The asteroid is similar in size to the object that exploded over Siberia, Russia, in 1908 in the Tunguska event. That explosion leveled hundreds of square miles of land, scientists said. While asteroid 2012 DA14 could potential create such destruction if it struck the Earth, there is absolutely no chance of an impact for the foreseeable future, NASA officials said. "This asteroid's orbit is so well known that we can say with confidence that even considering its orbital uncertainties, it can pass no closer than 17,100 miles from the Earth's surface," Yeomans said. "No Earth impact is possible." NASA scientists used advanced modeling techniques to map out the path of the asteroid with exact precision, and ground-based telescopes tracked 2012 DA14 since the asteroid's discovery last year by amateur astronomers. Researchers plan to keep tabs on the asteroid after it makes its closest approach to Earth somewhere over Indonesia at 2:24 p.m. ET (1924 GMT), Yeomans said. Some ground-based telescopes will be turned toward the asteroid as it shoots by, but the instruments won't catch sight of the asteroid until after it comes inside the orbits of geosynchronous satellites, Johnson said. Those post-flyby observations are still useful, however. Scientists are hoping to get a sense of what 2012 DA14 is composed of as well as any helpful clues about its structure and how it compares to the structure of other space rocks. "You can only collect this data when the asteroids are significantly close to the Earth," Amy Mainzer, a researcher at NASA's Jet Propulsion Laboratory in Pasadena, Calif. said. NASA astronomers and scientists around the world, meanwhile, regularly monitor the night sky for signs of previously unknown asteroids that may pose a potential impact threat to Earth. Yeomans runs NASA's Near-Earth Object Program Office at the Jet Propulsion Laboratory in Pasadena, Calif., to keep track of potentially dangerous asteroids. Although 2012 DA14 will be too dark to see with the naked eye as if flies by Earth, amateur astronomers with backyard telescopes could potentially catch a glimpse of asteroid as it makes its way across the sky, if they know when and where to look. It will be extremely difficult, however, because of the asteroid's speed, which will make it appear as a fast-moving pinpoint of light in the night sky, NASA scientists said. NASA officials also announced that they will be streaming the flyby live the night of Feb. 15. A telescope at NASA's Marshall Space Flight Center in Huntsville, Ala. will broadcast its view of the event from 6 p.m. to 9 p.m. ET (2200 to 200 Feb. 16 GMT).